You might think that I am a magazine junkie, but I promise that my 3 monthly magazines that come just happen to always come in and around the same day that's all! One of the magazines I get each month is Today's Parent magazine. On numerous occasions I have commented that there are some really great tips and recipes in each issue. However this month I found more than just a few, I found a whole bunch of recipes that I wanted to try. Now on a family related note, I know it might sound silly to some, but even though our little girl is only 9 months old, every time I bake or cook in front of her I always make a point of saying "You know, when you're bigger we are going to do this together". Of course she smiles every time with glee and I like to believe that she fully understands what I am telling her. I do plan to have her bake & cook with us in the kitchen as I personally think it makes meal prep more enjoyable. I can only assume that if she were to participate in the preparation then not only might she be more inclined to try whatever we've made, but also I know that I can keep a closer eye on her while devoting my attention appropriately to my cooking/baking. I'm all about the whole "two birds one stone" idea these days even more than in my pre-baby days. As well, I want to teach her what I know. I want to watch her to ensure she understands the importance of safety not only with the hot surfaces or sharp utensils, but also with regards to avoiding cross contamination and ensuring my dietary safety. In a medium bowl, whisk together egg, maple syrup and vegetable oil. 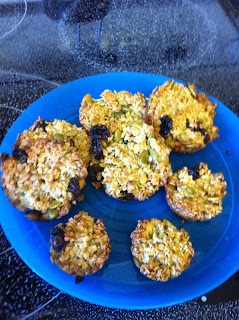 Stir in oats, pumpkin seeds, dried cranberries or raisins and sesame seeds. Generously coat a 12 cup muffin tin with oil. Divide oat mixture into 12 portions, about 1 heaping tbsp per muffin cup. Bake in centre of preheated oven until lightly golden around edges, 10-12 minutes. Carefully run a knife around the edges. Let cool completely. To maintain their cute shape, it's best to un-mould them as soon as they're cool., after about 5 minutes. Using a spoon, gently scoop and lift each coin out. These will keep well, stored in a single layer in an airtight container for 1- 2 days. Nutritional info per 1 coin: Calories 79; Protein 2 g; Carbohydrates 21 g; Fat 3 g; Fiber 1 g; Iron 1 mg; Sodium 7 mg.
* I did not fully measure the seeds and I imagine you could put whatever you want into these granola coins, but it will certainly change the nutritional content and possibly baking time as well. As you can see from the recipe here that this one was particularly easy and as such I ended up making a second batch while the first batch was in the oven. Since I only have one 12 cup muffin tin, I chose to make the second batch using a mini muffin tin. Rest assured, they look and taste just as good, they're just mini!